Shop > Incense > Cauldrons > Triple Moon Cauldron 3"
This petite, classic dark metallic, cast iron pot belly cauldron may be utilized as a container to hold offerings; as a censer that contains sand in the bottom to burn cone or stick incense, powdered incense, and even dried herbal blends upon a small piece of self lighting charcoal; as well as a vessel in which to stir up a small witch's brew or potion. Cast in a two parts and may have a rustic seamed appearance. 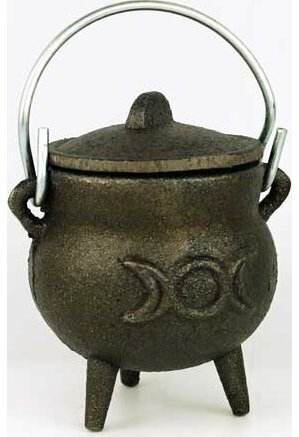 This cauldron is 2 and 1/2 inches in diameter across the top, stands approximately 3 inches tall, comes with a lid, and is adorned with a triple moon goddess symbol; the waxing moon on the left (maiden), the full moon in the center (mother) and the waning moon on the right (crone).